A tale of unique redemption and an exploration of good and evil featuring a hit man and a priest. tags: What's your darkest secret ? A tale of unique redemption and an exploration of good and evil featuring a hit man and a priest. 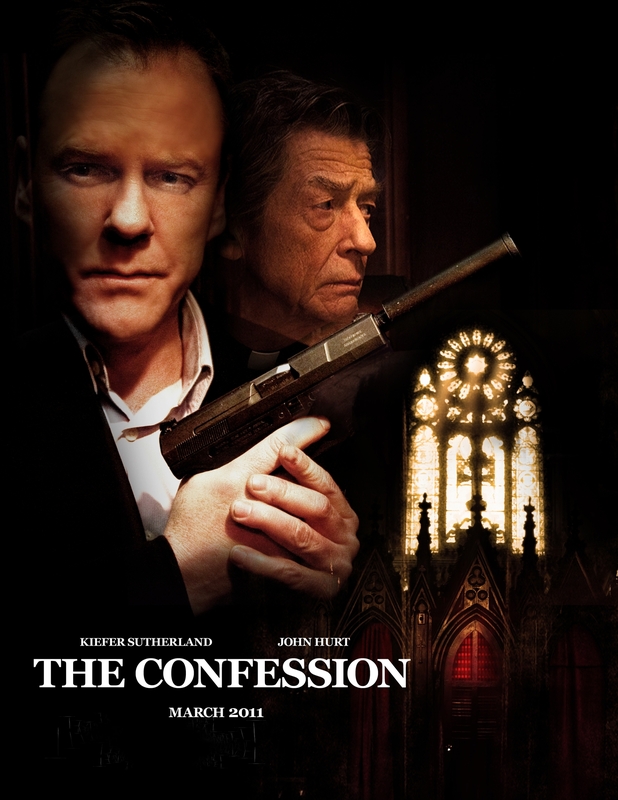 THE CONFESSION is a tale of unique redemption and an exploration of good and evil featuring a hit man and a priest. On Christmas Eve, the hit man enters a church to confess his sins. Through a series of gripping flashbacks, the Confessor's journey is revealed. Why was this film overlooked? I had thought everyone in Hollywood was asleep until I learnt that the film had originally been released as a webisode series and then went straight to DVD. What a shame! This is one of the most powerful films I've watched in decades. It provokes, it challenges, it stirs the emotions -- and 95% of the film is held together with dialogue by two men sitting in a confessional. I watched it twice in one day. The script - the acting - the way the plot is developed - they are flawless, in my opinion, and worthy of any award. Kiefer Sutherland is perfectly cast as the assassin - reaching out for answers. And it's hard not to empathise with him, once you learn of his background and his obvious pain. John Hurt is brilliantly cast as the embattled priest. He has that weather-beaten face that tells a thousand stories. Another thing that puzzles me is why the two lead stars of this movie are not given top billing credit - which went to 3 bit- part roles? Something's crook in Tobruk, as they say in my country!! Much credit to all the actors - this is a film I cannot fault, and writer-director Brad Mirman is one name I'll be following with interest in future. I wish each episode was a little longer in length. It just start getting good and it says to be continued. It is very suspenseful and thought provoking. I think you may need to have a strong stomach at times during certain scenes but love the realism of the filming. I like that you can watch anytime and if you miss a day that you can watch back episodes. Since we don't have "Jack Bauer" and 24 anymore, I'm glad Keifer has embarked on another project. Good way to get a following and a test audience via the internet. I could see this as a TV show eventually. Even a movie would be an option once there is a large enough interest. Great job, looking forward to more episodes.